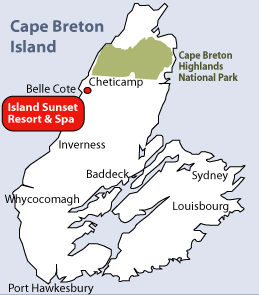 Belle Côte is located 15-minutes south of the community of Chéticamp, along the Cabot Trail. Travelling from the Canso Causeway, follow Route 19 along the Ceilidh Trail. This route will take you through the communities of Craigmore, Judique, Mabou and Inverness. Once you reach Margaree Forks, veer to the left and follow along to Belle Cote. The Resort is located on the left side of the road in the community of Belle Cote. Watch for the sign. From the Trans-Canada 105 at Canso Causeway, follow along through Wycocamagh and towards Baddeck. Once you reach the Red Barn at the Margaree turn-off, turn left and follow along through the Margaree Valley, through Margaree Harbour and onwards toward Cheticamp. The Resort is located on the left side of the road in the community of Belle Cote. Watch for the sign. Click here for a map of Nova Scotia! "We recently stayed in your cottages for a family reunion and would like to thank you for such great facilities;it was truly a home away from home! We would certainly recommend the Island Sunset to our friends, Thanks Again!"